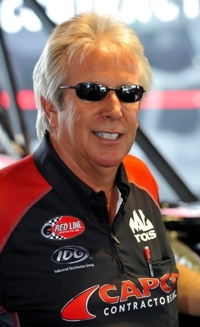 May 10, 2013 -- Steve Torrence’s hunt for a new crew chief ended Thursday when he selected Lee Beard, one of drag racing’s best, to assume those duties on the Torrence Racing/Capco Contractors Inc. Top Fuel team. Beard inherits a team that slipped from NHRA Mello Yello Racing Series championship contention into ninth place in the final six 2012 races and then started slowly in this season’s initial half-dozen events. “I am excited to have Lee on our team,” said Torrence, who won his first Top Fuel race at Atlanta Dragway last year. “We made the change because we need to try something new in an effort to get back into this championship hunt. The results so far this season do not reflect on the amount of hard work and talent this team has. “I also want to be perfectly clear that this season’s record does not reflect on Richard Hogan’s skill as a crew chief. He is an amazing tuner. I have to thank Richard for all the work he did to help us put this team together and win three races in our first season. Unfortunately, this team is in a slump and we simply needed to make a change. That is why Lee is coming on board." The transition from Hogan to Beard begins Friday as the rain-delayed Summit Equipment Southern Nationals begins its two-day stint at Atlanta Dragway in Commerce, Ga.
“Lee brings a different tuning style and I’m excited to see what effect that has on the car. It makes me that much more excited to get back in there and go for a ride,” added Torrence. He has accumulated 54 national event titles with 11 different drivers and his drivers accounted for 65 top qualifying positions in Top Fuel and Funny Car. He tuned Gary Ormsby to the 1989 Top Fuel World Championship and was team manager for series champions Cruz Pedregon (Funny Car, 1992) and Tony Schumacher (Top Fuel, 2009). The tight racing schedule doesn’t provide Beard with much time to get acquainted with his new team and, more importantly, the tune-ups for the often cantankerous nitromethane-fueled motors. There will only be two qualifying sessions Friday and eliminations follow on Saturday. It is a tricky situation for all the crew chiefs, but it’s even harder for Beard because he is not familiar with the Capco dragster.